172 pages | 3 B/W Illus. 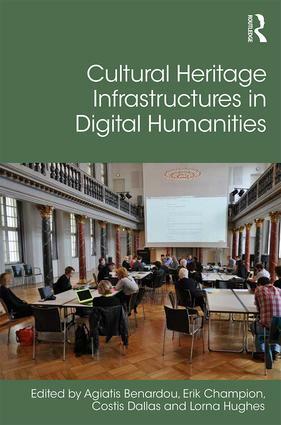 "In Cultural Heritage Infrastructures in Digital Humanities, editors Agiatis Benardou, Erik Champion, Costis Dallas and Lorna M. Hughes offer a volume that examines the impact that emergent digital research infrastructures in the humanities have had on the academy and the wider public. Anyone concerned with the future of digital humanities research will find much to ponder in this timely and important collection of essays." 11. Digital humanities research needs from cultural heritage looking forward to 2025? Agiatis Benardou is a Senior Research Associate at the Digital Curation Unit, Athena Research Centre, Greece, and a Teaching Fellow in Digital Curation at Panteion University of Social and Political Sciences. Erik Champion is UNESCO Chair of Cultural Heritage and Visualisation at Curtin University, a steering committee member of the Curtin Institute for Computation (CIC), and a member of the Australia Asia Pacific Institute (AAPI). Costis Dallas is Director of the Collaborative Programs and Associate Professor at the Faculty of Information at the University of Toronto, Canada, and a Research Fellow at the Digital Curation Unit, IMIS, Athena Research Centre, Greece. Lorna M. Hughes is Professor in Digital Humanities at the University of Glasgow.